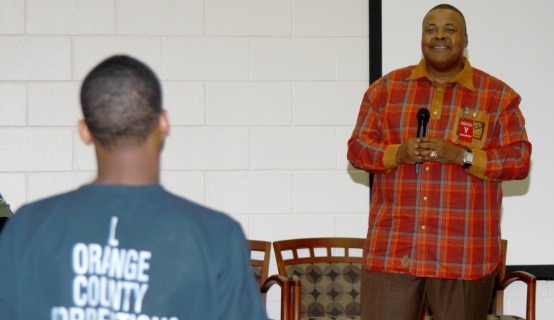 Every year, one of the nation’s largest correctional facilities marks Father’s Day in remembrance of a man who served as a positive role model to so many young men – Orange County Corrections Chaplain Bernard Fleeks. Although Fleeks passed away recently, his legacy lives on. Chaplain Bernard Fleeks dedicated years of service to the juveniles housed within the Orange County Corrections Department, which is currently home to about 25 young men ages 15 to 17. Fleeks, who believed in the art of words and the spirit of forgiveness as a means to overcome, remains the inspiration, even today, for a group of young men who have never met him. The annual event, while a bit unconventional in comparison to a family cookout, is voluntary and encourages teens to pen an open letter to their dad titled, “What Would I Say to My Father.” The words provide an emotional glimpse into the lives of a group of young men who may be heading down a troubling road. If a juvenile is housed within OCCD , it means that they have been charged as an adult with a serious offense. At this point, chaplains, volunteers and correctional staff know that they have few opportunities left to steer these youth away from an uncertain fate. The sponsor of this year’s event, Advanced Information Systems Group Inc., selected four teens to read their open letters aloud to an audience, which included mothers and sisters. While each letter was unique in its own way, there were common words used by the youth including abuse, violence, absence, trust, drugs, fear. Still, in between the anger and resentment, there were signs of forgiveness and love. The letter writing tradition will continue next year. While these young men may have moved on, the best reward for those who have become a part of their lives at these difficult crossroads is that they are able to turn in their blue jumpsuits and one day be the man they hoped their father could be. Orange County Corrections would like to thank the corrections officers, program personnel, volunteers, chaplains and sponsors who made this event possible.